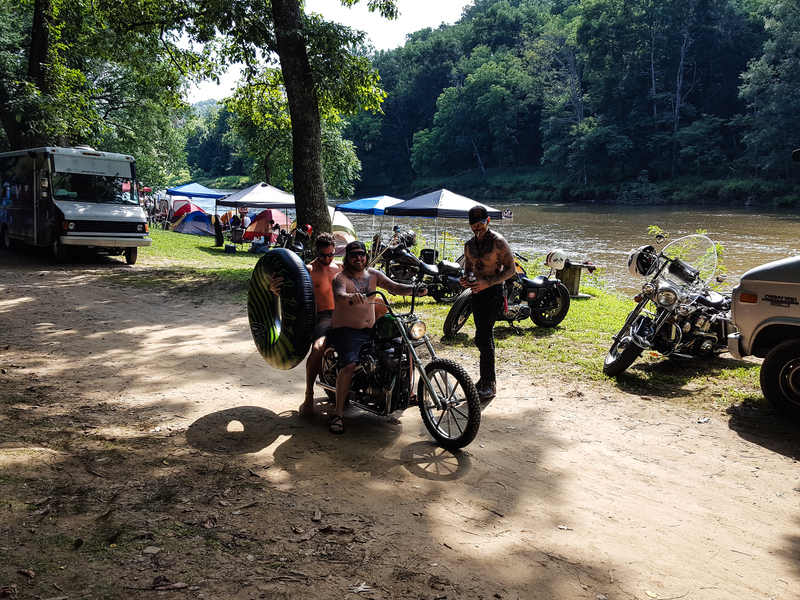 The revival of chopper culture has brought with it a resurgence of motorcycle events that actually revolve around riding motorcycles instead of the trailer strewn “bike weeks” they have been plaguing the world for the last 25 years. Motorcycle shows, road runs and campouts that harken back to the chopper glory days of the 60’s and 70’s have started to crop up around the country and the parties are just as big and wild as those found in old issues of Easy Riders. For those on the East Coast, Zac Gibbons put together an epic event called the Twin Rivers Chopper Campout which lived up to all the hype of a real chopper campout. The key to a good campout is finding the right location. You can’t just pull into the local KOA with 200 motorcycles and expect to receive a warm welcome. What you want is place that is far enough out of the way that you won’t be bothered, but not too remote that you have to drive three hours to find a case of beer. After recon missions into the Blue Ridge, Zac settled on the town of Crumpler, NC which had just the right mix of “out in the middle of nowhere” and “small town America”. The campground itself was located on the banks of the New River which was very scenic, but the real plus was the owners of the campground were cool with waiving all the typical “campground rules” for the weekend. I blew off work on Friday, so I got an early start on the 150 mile ride to western NC. By noon I was rolling into the campground on my ’64 panhead and there were already tents and motorcycles stretching out in a long line down the banks of the river. The campground was located on a horseshoe bend in the river with the two legs of the horseshoe divided by trees and large rock outcroppings. This worked out great because the RVs and families were on one leg of the horseshoe and we had the entire other half of the campground to ourselves with a natural barrier in between to block off all the noise. By early evening, the official head count from the front office was already over 200 and things started cranking up. Daniel Biggins was up in the DJ booth belting out a mix of heavy metal, rock n’ roll and country music and there was a large crowd gathered around the bonfire doing their best to dance in time to the music. While the bonfire was definitely the main event, smaller parties spread out along the river with a good flow of people just wandering from one campfire to the next swapping stories and enjoying a beer or three. The music kept on until well past midnight and there was just a few hours left before dawn for everyone to grab some sleep. About the time the sun was high enough to start heating everyone’s tent to uncomfortable temperatures, a food truck pulled into camp laden with breakfast foods and people started stumbling out of their tents staggering toward the truck like the walking dead. Without any set events during the day, everyone was left to break off into groups and do whatever they wanted. Being right in the middle of the Blue Ridge Mountains meant there was great riding just a few miles away and motorcycles were roaring in and out of the campground all day to hit the twisties. The river was also a good option as it had a nice swift current that made for great tubing, but it definitely wasn’t class VI rapids, so you could just wade out for a dip to cool off. While everyone was staying busy on Saturday, I went out with Zac, Daniel and Sean to hand out the “Cool Bike” awards. This was basically a custom engraved wooden plaque given out to a dozen motorcycles that we agreed were the best machines that rode to the event. I wanted to limit the running to just panheads, as they are the coolest motorcycles, but the other guys convinced me that there were some non-panheads that were pretty cool too. In the end, there were panheads, shovelheads, Sportsters and even a Triumph that took home a plaque. Saturday night started out with the much anticipated raffle. Zac had pulled in over two dozen sponsors and they had shown their support by donating some really great prizes. There were the usual clothing items, stickers, banners, etc. along with some really cool custom parts like a set of shaved lowers and motorcycle helmet turned into a lamp. I was really hoping to win those lowers, but I still came away a winner with a pile of t-shirts and some handlebar grips. Once the raffle concluded, the music was turned back up and the bonfire was stoked for another long night. Having set a one day beer sales record at the local mini mart, everyone was well stocked for another night of partying. Throughout the night there was everything from impromptu bike games to skinny dipping in the river. I think the last holdouts finally stumbled into their tents after 4:00 AM when the wood finally ran out for the bonfire. Sunday morning came early, but everyone was up with the sun strapping gear to sissy bars and getting ready for the ride home. Much appreciated by the founders of the campout and I’m sure the owners was how everyone pitched in and left the campsites as clean if not cleaner than before we arrived. Actions like that are what keeps local businesses happy to see us ride up year after year which is good for everyone. For those that are ready for Twin Rivers 2018, follow @twinriverschoppercamput on Instagram or Facebook to keep up with the latest from Zac on what he has planned for the next year. I can already tell you, you won’t want to miss it.